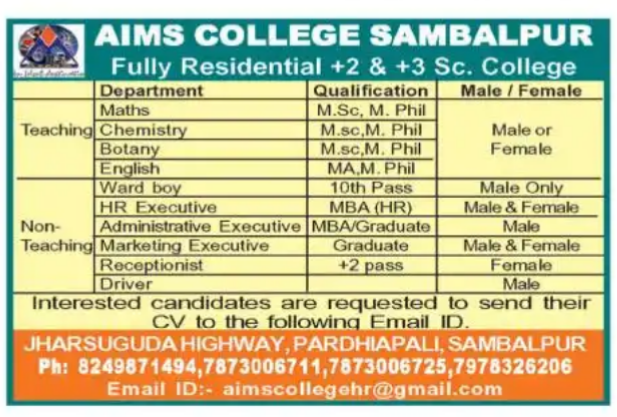 AIMS College,Sambalpur,Odisha has advertised for the recruitment of Teaching Faculty- Lecturer jobs vacancies. Interested and eligible job aspirants are requested to walk-in immediately. Check out further more details below. 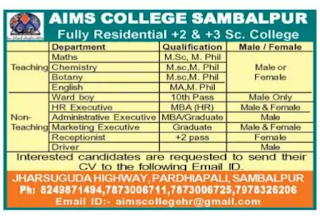 Name of the College: AIMS College, Sambalpur,Odisha. About College: Liberalization, internationalization, globalization, the growing web of communication and information technology have brought about profound changes in the organisation of academic life. So the educational institutions should break away from traditional paradigms and reappraise their role and functions in order to meet the emerging challenges of the new century and to avail future opportunities. Keeping all these in view, AIMS College of +2 Science has been established. Situated at Majhipali, Sambalpur, it aims tocater to the needs of the students of Odisha. Higher Secondary (+2) Education is the stepping stone towards the journey for a bright career. How to Apply: Interested and Eligible candidates are requested to send their CV to following email id.